Because it sells tickets in all but a handful of states, as of publication, the Powerball lottery game regularly offers jackpots that grow to hundreds of millions of dollars. If you win a jackpot -- and your odds of doing so are roughly 1 in 175 million -- you can claim your prize one of two ways: as an annuity or a lump sum. So, which option gives you more money? In a way, the payouts are actually the same. Whenever you see a Powerball jackpot amount advertised, the figure they use represents the amount that would be paid out as an annuity -- a series of payments spread out over time. If you win a jackpot of, say, $150 million, that means 30 payments that will add up to $150 million, before taxes are taken out. You get the first payment immediately, and the rest come at one-year intervals, so the money is paid out over 29 years. 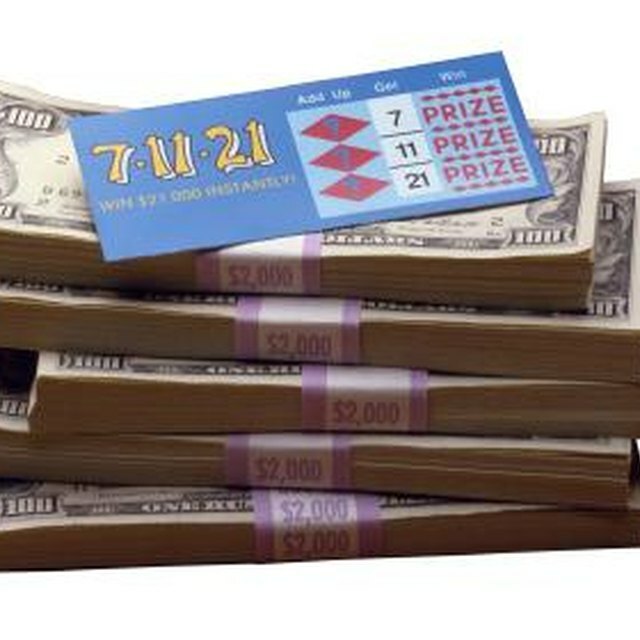 Powerball structures a winner's annuity so that each annual payment will be 4 percent larger than the previous payment. The lottery says it does this to help winners "keep up with inflation," although it works out to Powerball's benefit, as you'll see. So, if you take a $150 million jackpot as an annuity, you won't get 30 payments of $5 million (before taxes). You'll get 30 payments that average $5 million. Early amounts will be less than later payouts. If you choose to take your winnings as a lump sum, you'll get considerably less than the stated jackpot amount. For example, a jackpot of about $580 million in November 2012, at the time the biggest in Powerball history, had a pretax cash value of $380 million, or roughly 65 percent of the total. The reason the lump sum is smaller lies in how Powerball funds its prizes. When a jackpot winner picks the annuity option, Powerball invests a certain amount of money in interest-paying U.S. government securities; over 29 years, that investment generates enough money to pay the entire jackpot. If a winner chooses the lump sum, Powerball doesn't make an investment -- it just gives the winner the money it would have invested. The cash value of a Powerball jackpot is the "present value" of the annuity -- it's the amount you would have to invest today to produce cash flows equal to the annuity payments. The exact amount of the cash value, then, depends on the interest rates paid on government securities. The higher the rate, the lower the cash value will be. The further an annuity payment is in the future, the lower its present value, because invested money has more time to grow through compound interest. Because Powerball puts the largest payments at the end of the annuity (to keep up with inflation), that also reduces the present value, and thus shrinks the lump-sum payment. Which option is the "smarter" one from a purely financial standpoint really boils down to whether winners believe they can earn a higher return on money than Powerball would when it invests in government securities. According to "USA Today," at the time of the record $580 million jackpot, the top yield on Treasury securities was 2.8 percent, and financial advisers were pretty sure someone could get a better return than that, especially over the long term. If you think you can earn a higher return, take the lump sum and invest it. If you don't, take the annuity.